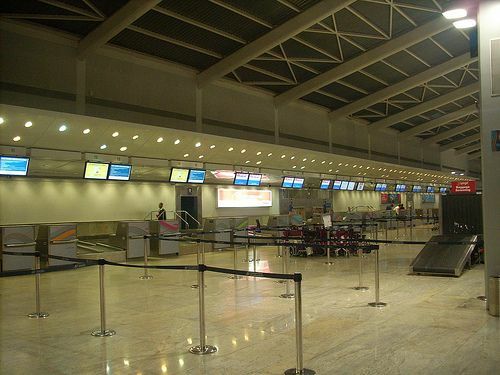 Paco has just arrived at the International Airport in Mumbai. Normally, you have to be two hours before boarding to check in. However, Paco does not know what time his flight leaves. In fact, he does not know when he will fly since he has not bought the ticket yet. He hopes he can fly to Saigon. The airport is so big that he has spent half an hour searching for the correct desk to get the ticket to Shanghai. He has heard this is the busiest airport in India. He can see lots of people rushing up and down the busy corridors looking for their respective boarding gates. Suddenly, a woman runs into him and he falls down onto the floor. The woman apologises to him for not having seen him and continues running. He wants to escape from that place as soon as he can. Once at the desk he politely asks a clerk for a ticket for the next flight to Shanghai. The clerk tells him that, unfortunately, there are so many people who want to fly there that there are no tickets until next Friday. The woman has such a sweet voice and has told him that so politely that he does not care. He will buy the ticket now and leave for Shanghai on Friday. After paying some hundreds dollars for the ticket Paco turns over and is about to leave when he hears the same beautiful voice: “Sir, I forgot to tell you. I’m afraid it is not a direct flight. You will have to make a stopover in Karachi, Pakistan”. Paco smiles at her and thinks: “Your voice is so beautiful and you are so kind that I could never complain to you about that”. However, the only words that come out of his mouth are: “Thank you very much for the notice, miss, I’m not in a hurry”, and he leaves. 1. According to the text, does Paco feel comfortable at the airport? 2. According to the text, will Paco fly straight away to Shanghai? 1. No, he doesn't. According to the text, he wants to escape from it as soon as possible. 2. No, he won't. Unfortunately, the clerk tells him he will have to make a stopover in Karachi, Pakistan. In the passage there are four cause-effect sentences which are correlative, can you guess which ones? 1. The airport is so big that he has spent half an hour searching for the correct desk to get the ticket to Shanghai. 2. The clerk tells him that, unfortunately, there are so many people who want to fly there that there are no tickets until next Friday. 3. The woman has such a sweet voice and has told him that so politely that he does not care. 4. “Your voice is so beautiful and you are so kind that I could never complain to you about that”. With these correlative connectors, the emphasis is put on the cause. Of course there are more cause-effect sentences formed by means of connectors. Despite the fact that they will be studied in unit 6, have a look at them by clicking here, since they are important to improve your English. By the way, don't forget to do the activities at the bottom of the website! On this occasion, we've found it better to give you a link to an excellent grammar explanation of the use of so and such in English. So, click here to have access to it and don't forget to take good notes! There are lots of websites where you can find easy explanations and plenty of examples. Remember that the more you read and practice the better for you. Taking that into account, click here to have a look at another easy explanation with Spanish translations. 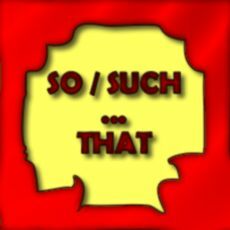 An excellent presentation talking about so and such can be found here. Now, it's time to practice. Click on the exercises in order to complete good activities to improve your knowledge of this topic. Fill in the gaps with so, such, such a, such an, so much or so many. 1. Paco was JXUwMDJiJXUwMDFj astonished at the clerk that he could say no word. 2. He speaks English JXUwMDJiJXUwMDFj fluently that he has no problems when communicating. 3. There were JXUwMDJiJXUwMDFj JXUwMDM1JXUwMDBjJXUwMDBmJXUwMDE3 people at Kravitz's concert that nobody else could enter. 4. It was JXUwMDJiJXUwMDA2JXUwMDE2JXUwMDBi bad weather that we didn't go out. 5. The clerk had JXUwMDJiJXUwMDA2JXUwMDE2JXUwMDBi JXUwMDM5 beautiful voice that Paco got astonished. 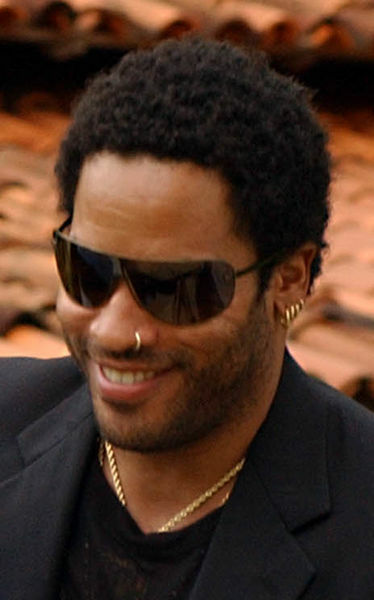 Do you know who Lenny Kravitz is? Yes, he is the American singer-songwriter, multi-instrumentalist, record producer, and arranger whose "retro" style incorporates elements of rock, soul, funk, reggae, hard rock, psychedelic, folk and ballads. In one of his songs, "It Ain't Over Till It's Over", Kravitz uses the structure studied plenty of times. Click on his photograph to listen to it. To get the lyrics of the song, click here. You have studied an important way to express cause-effect sentences in English. Finally, let's have a look at some verbs which are used in the text and which are frequently followed by concrete prepositions. But this will be in the final section of the topic.